Janie Bress - My North Shore Blog: Tips for Making Your North Shore Real Estate More Green! 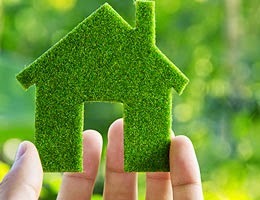 Tips for Making Your North Shore Real Estate More Green! Earth Day can be an excellent reminder to evaluate your North Shore Real Estate for any potential upgrades that will make it more environmentally friendly. Beyond just protecting the environment, these improvements can also help you save money and increase the value of your home as well. As a North Shore Realtor, I come across many buyers today who desire these improvements. While there are plenty of things you can do to make your North Shore home more green, here are a few that are easy to implement. Upgrade Your Appliances: If the time comes when you have to replace one of the appliances in your North Shore home, purchase one with an ENERGY STAR rating. This rating indicates that the appliance uses 20-30% less energy than the federal limit, and that means reduced electric bills for you. Use a Programmable Thermostat: While many homes already have these thermostats, a lot of Chicago’s North Shore homeowners do not utilize the programmable feature. In the winter, set your thermostat to a lower temperature while you’re out and higher in the summer. In the winter, every one-degree reduction will save you approximately 1% over an eight hour period on your energy bill. While that doesn’t seem like much, a five-degree reduction while you’re at work could really make a difference! Swap Your Light Bulbs: Compact fluorescent lamps (CFLs) have become an increasingly popular alternative to the standard incandescent light bulb. While these bulbs tend to cost a bit more upfront, they will save you money in the log run. Not only do they last significantly longer than a “regular” light bulb, they also use far less energy. Conserve Water: Consider switching your faucets and shower heads to low-flow replacements. In addition, you may want to look into upgrading your toilets to low-flow models if your North Shore home doesn’t already have them Low-flow toilets can save up to 3000 gallons of water per year compared to standard models. Choose Eco-Friendly Home Improvement Supplies: With the rise of building “green”, there are now a multitude of sustainable and environmentally friendly options for home improvement supplies. If you are contemplating a flooring replacement in your North Shore Real Estate, explore the bamboo choices on the market. Bamboo is available in a wide variety of styles and colors and is a sustainable building material. You can also opt for a more eco-friendly paint that emits less toxic fumes and pollution into the air. Pick those that are zero- or low-VOC (volatile organic compounds) as a healthier alternative. This is just a small sampling of the many upgrades you can do to your North Shore home to make it more green and energy efficient. If you are considering selling your home in the near future, these improvements will be valuable in attracting potential buyers! Whether you’re looking to buy or sell, please contact me. It would be my pleasure to assist you with your North Shore Real Estate transaction.